30th and 31st March 2019 Bukit Jalil Stadium, Kuala Lumpur. Russel and TeamTaib were back in the city of his birth this weekend in KL Malaysia for a homecoming celebration and a return to the international stage. Saturday saw progress through the heats of the men’s 100m to the final. Unfortunately there was no podium position for us this time and Indonesian sprinter Lalu Muhammad Zohri won the gold medal (10.20s). 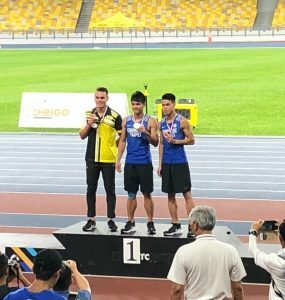 Congratulation to fellow Malaysian sprinter Zulfiqar Ismail who crossed the line in second! Sunday however saw Russel amongst the medals. Progressing through the heats to the final and securing Silver for Malaysia (21.12s). Taiwan’s Tai Sheng Wei who clocked 21.00s flat took the gold. A thank you to the fans for your support! We look forward to seeing you again soon.